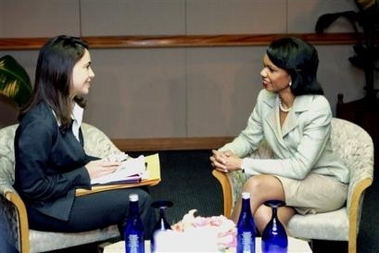 Secretary of State Condoleezza Rice meets with Anti-Chavez Activist Maria Corina Machado at the OAS meetings in Ft. Lauderdale on Monday. President Bush implored Caribbean and Latin American nations on Monday to continue on the path of democracy and warned against leaders who prevent democracy’s progress and blame others for it. Addressing the general assembly of the Organization of American States, Bush also urged Congress to pass the Central American and Dominican Republic Free Trade Agreement, which is meeting bipartisan resistance on Capitol Hill. Bush noted that fewer than half of the 34 nations that comprise the group had democratically elected governments in 1974, the last time the general assembly met in the United States. He equated democratic advances in the region to the spread of freedom in the former Soviet bloc nations and to the U.S.-led effort to spur the rise of democratically elected governments in the Middle East. But he warned that there was still more to do for Latin American and Caribbean citizens to experience true democracy. “And one day the tide of freedom will reach Cuba’s shores as well,” he said. 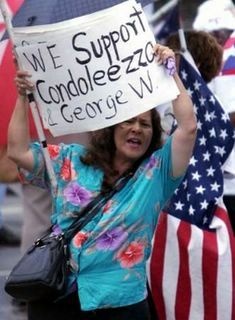 A Bush supporter at the OAS Meetings in Ft. Lauderdale on Monday. A democratic wave that has occurred in Latin America is “something to be proud of” but the issue now is, “Can those democracies deliver for their people?” Rice said. “There are clearly some troubled democracies in Latin America and I’m very supportive of Mr. Insulza’s idea that the OAS needs to be proactive and often early in trying to help in some of these circumstances,” she added. The Herald interview was conducted just two days in advance of a meeting of the General Assembly of the OAS in Fort Lauderdale, Florida June 5-7, which Rice is to chair. Meanwhile Hugo Chavez accused the Bush Administration of trying to impose a “Global Dictatorship”. And, even Trinidad is saying that Chavez needs to tone down the rhetoric. Also, A. M. Mora y Leon at Publius Pundit has some more very disturbing news from South America in regards to Chavez.